Maryland Pink and Green: Rent a Lilly Dress! Imagine my surprise when I found out that Rent the Runway is now stocking the latest styles from Lilly Pulitzer in addition to the fabulous brands they already offer. If you’re not familiar with Rent the Runway, you’re in for a treat! This members only website offers dresses from the current season from top designers for short term rental...perfect for special occasions. How many times have you paid hundreds of dollars for a dress that you wear only once or twice? If you’re anything like me, your closet is full of special occasion dresses worn only once. A much better solution is to rent a dress at dramatically reduced prices. It is not a novel concept, but is unfamiliar to many people. Rent the Runway has this down to a science and takes all of the guesswork out of the process. Worried you won’t get the right size? In between sizes? You get to choose two sizes of the dress so that you’re sure it fits. Fit consultants are also available for a live online chat to answer questions. Their advice on body type is so helpful, too. For petite peeps like me, the full length gowns are available in two lengths for each size. No hemming needed. Not sure about the dress you chose? You can rent a second option dress for only $25 and decide between the two options. I also like the add on option of a second dress for weekends when you might have two or more events. Your selections are shipped to you in time for your event and are in pristine, freshly cleaned condition. When you’re finished, simply place the dress in the pre-paid shipping box and return. No need to worry with cleaning or laundering. Here are some Lilly Pulitzer dresses that are brand new in stores that you can rent! 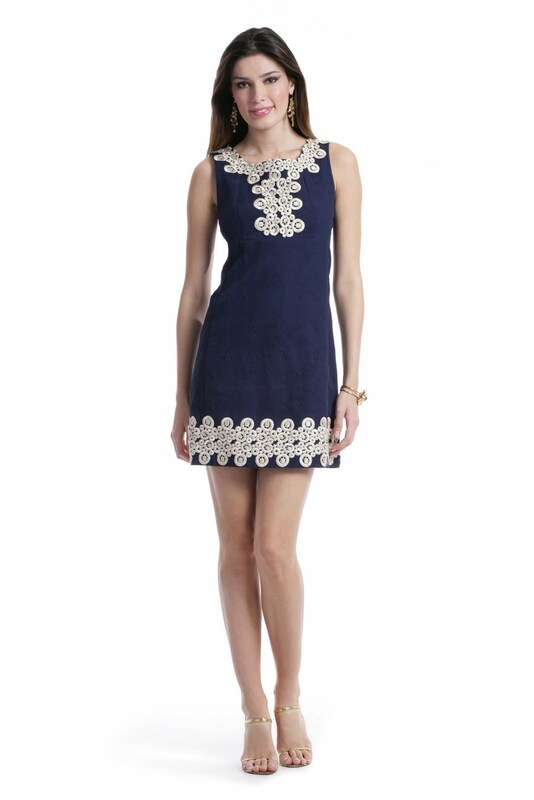 Adelson Jacquard dress in Bright Navy…this would be perfect for a shower or other special event. The fabric of this dress is so substantial and has a gorgeous detailed texture. Pictures don't do justice to this dress ~ trust me on this one! Pair it with a Shere or Babs in metallic gold lurex and you'll look amazing. It's one of my favorite looks and is so versatile. The Whitaker dress is such a great little date night dress. The print is the newest Lilly has to offer and is flying off the rack at full price. The Shorely Blue Optical Confusion is part of the Pop Art collection and is a comfortable and flattering silk jersey fabric. Brides and graduates take note…and reserve early! The Bowen dress is quickly becoming an annual favorite among those in the know. Look fabulous at your rehearsal dinner, bridal shower, or graduation in this stunning dress. I love the lace detail. You can reserve rental dates in advance for dresses on Rent the Runway and I would encourage you to do so, especially with a dress like the Bowen that is sure to be a favorite in May and June. Pink and orange? Almost as good as pink and green! The Nadia dress is so flattering. I especially love the detail at the neckline. These silk stripes will take you anywhere in style. Other favorite brands featured on Rent the Runway include Milly, DVF, and Lela Rose. Rent the Runway is a budget friendly way to wear the most recent styles without damaging your bank account too much. Here’s your invitation to Rent the Runway. Enjoy your Wednesday! This week is flying by because we had a holiday on Monday for President's Day. Yesterday was a snow day. So I can't believe that it's already Wednesday. This is so exciting! Thanks for letting us know! Glad to hear RTR has Lilly now, they seem to be doing quite well! Will defnitely check out bamboopink! I love that pink and orange Nadia! I've never rented a dress at RTR, but what a great idea! And they have Lilly now! Even better :) I'm going to have to check them out soon! I am having a hard time registering and accessing the RTR site, anyone else experiencing the same? I look forward to checking it out, Thanks Bethany! Sounds like a great service, especially for the college crowd that maybe can't afford formals on a college budget. I also look forward to checking out Bamboo Pink. It does seem to be glitchy, Sue, but I just checked and seems to be working now. I agree that this is a great option for college students or people who need many outfits in a weekend or season. Wish they would have had something like this when I was in college! !